← Lower Powerline Road in Five Minutes! Changing the chain on my XT-250. Everything comes off! I ended up using a chain breaker. How silly of me! I thought “how hard can changing a motorcycle chain be?” The answer: things have changed greatly since I last changed the chain on a motorcycle, which is when I was a teenager, over 40 years ago! Should I have taken the bike to the shop? In hindsight, probably, though I did learn a lot in the very frustrating, drawn-out process. First, why did I need to change the chain? Answer: it was kinking, even though I lube it liberally. And, the rear sprocket was showing signs of wear; the front sprocket showed even more wear. After all, even though this is only a 250 cc bike, I beat the living daylights out of it on the trails. After all, I bought it to use it, not admire it! And, as every motorcyclist knows, one changes both sprockets and the chain at the same time. I found the rear sprocket at Highland Cycles in Montrose, CO. They also provided the replacement chain. The front sprocket, a 14-tooth sprocket instead of the stock 15-tooth sprocket, came from Superior Racing Sprockets in Bandon, OR. Okay, so take everything apart and remove the old stuff. Right? Wrong! The OEM chain is an endless loop (no master link). I thought unlooping it from the rear wheel and the front sprocket was all it would take. How wrong could I be? Per the Yamaha service manual, I also had to remove the swingarm! That really gave me pause. That’s like taking the motorcycle apart to the frame! And there’s this big hairy spring involved, not to mention a shock absorber charged to a million PSI. Hmph. So, off it was to Planet Motorsports, which in my absence has recently changed hands, to get a chain breaker. Yes, it does just what you think it might. It’s an almighty strong little thing that presses out the pin that holds two links together. I broke the chain and removed it. After some fun mounting the new sprockets, I put the rear wheel back on (after packing it with copious quantities of grease). I threaded the new chain in place and went to install the master link. Oops…except the master link didn’t want to go on. You see, it’s an O-ring chain, so it had all these tricky little parts. I put them together, but the final link simply did not want to go on. After consulting with Planet Motosports and Highland Cycles, who assured me it really would go on, but it would be tight, I found a way to use the chain breaker as a chain maker. I literally pressed the link onto the pins. That took considerable doing, given that I did it wrong a few times, but at last I was ready. I acknowledge my wife’s indispensable help here: there are two many little thingees that need to be perfectly lined up for one person to put the rear wheel back on. Two hands don’t do it, but four do. At least I thought I was ready. The chain was awfully loose! I tried riding with it, but found that the front sprocket started skipping whenever I put any real load on the engine (such as going up a steep hill), not a good sign. More consulting. The chain, I came to find out, is shipped a few links long so it can be a “generic” chain. That meant removing a link or two and then repeating the whole masterlink thing. Grumble…. But, it appears that the outcome was serendipitous. I took it out today along County Roads 2 and 4 and gave it a real workout. Works like a charm! Okay, I’ve proved I can do it myself. Now maybe next time I’ll take it to the shop! The rear wheel ready to be mounted on the bike. You can just see the new rear sprocket (it’s dark) and the ample grease in the axle hole. 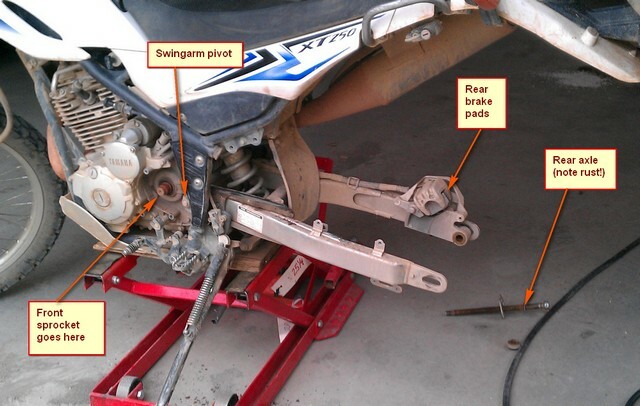 This entry was posted in Motorcycling and tagged changing the chain on a motorcycle. Bookmark the permalink. Getting ready to do this. The bike only has about 500 miles on it, the the OEM chain is rusted pretty bad (previous owner didn’t take care of it well). I couldn’t find a master link on it, so consulted the WWW – and here we are. I just ordered a new chain (with a master link) for my specific bike (2013 Yamaha XT250) for a mere $16. … the time it would take to clean up the old chain just isn’t worth the time. Wow, glad I learned through your, ahem, mistakes.. LOL. However, you probably saved yourself a bundle. They wanted $80 to change my front brakes. I did it myself in 5 minutes!